BoxCycle - Buy Used Moving and Shipping Boxes Locally for Less! Used boxes are great for the environment and your wallet, but getting them can be a hassle. We minimize work, uncertainty, and delays to help you get your boxes and get on with your day. How Do I Buy Boxes From You? How Do I Order? How Does BoxCycle Work? How Do I Buy At the Seller Location? Can I Buy Boxes Outside of the United States? How Do I Pick a Listing to Buy From? What Condition Are the Boxes In? How Accurate is the Size Information? How Soon Can I Pickup My Boxes? What If My Order Is Urgent? Can I Have My Boxes Delivered? Can I Look at the Boxes Before Buying? How Do I Get the Seller's Address? How Long Do I Have to Wait For Appointment Confirmation? What If the Seller Doesn't Reply? What Notifications Will I Receive? How Do I Track Order Status? Can Boxes I Order Be Out of Stock? How Do I Cancel or Adjust An Order? What If Boxes Are Not As Described? What If the Seller Is Not At the Appointment? What If I Can't Find the Seller Location? How Do I Report Issues or Complete an Order? How Long Do I Have? We are based in San Francisco, CA. Boxes are available for purchase throughout the United States; visit our Buy Boxes section and enter your location to see listings in your area. If you'd like to buy outside of the United States check	international info. 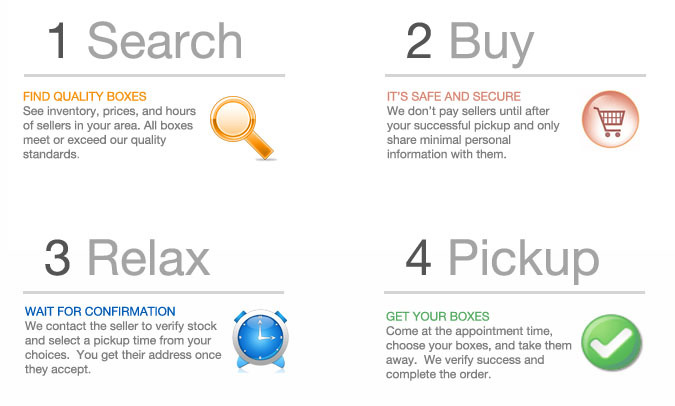 Buy From Seller Listings - Visit our Buy Boxes section and enter your location to see available listings in your area. Click the 'Buy From This Seller' button	and complete checkout to place an order. If you don't see boxes you want, create a Wanted Listing to be notified when matching boxes are listed near you. Keep reading this page for all the details and common questions. Create a Sell to Me Listing - Allow people to sell you boxes by creating a Wanted Listing with specific box information and then converting it to a Seller Wanted Listing. This works best if you need large quantities of boxes on regular bases. Learn more about Sell to Me Wanted Listings. Although BoxCycle is safer than many alternatives, you are still buying from independent, unvetted third-parties and should take common-sense safety precautions such as considering the pickup neighborhood, selecting appointment hours you are comfortable with, and bringing along friends if you are concerned. Similar to what you'd do if you were responding to an online or a newspaper classified ad. For additional peace of mind consider buying from A+ sellers. These sellers have a history of successful transactions through BoxCycle. You place an order online through our Buy Boxes section. For details on what happens after you order, see our Order Flowchart. All orders must be placed, and paid for, online through our website. We accept all major credit cards as well as PayPal. Your payment will be authorized, but not charged, at order time. We'll pay the seller, and charge you, only after	your successful appointment. All payment information is handled securely and is not shared with sellers. If you prefer to not share your financial information with BoxCycle you can do so by paying us through PayPal. Details - Minimum order, lead time, etc. Each seller listing has their own numbered marker icon you can use to locate the seller on the map and their own 'Buy From This Seller' button you can use to place an order. All available information is generally provided in the listing, but if you have questions feel free to contact us. We designed BoxCycle to eliminate the need for buyer-seller communication. Listings include lots of information, usually all that is available, and our checkout takes care of payments and appointments. If needed, please contact us and we'll be happy to help you; we'll contact the seller for you if necessary. Reduced time commitment makes it more practical for sellers to list their boxes which in turn makes finding boxes to buy easier and allows for greater reuse. You will be able to contact the seller near your confirmed appointment time if necessary using our free Anonymous Connect service. For information about a specific box click on the underlined box name in the listing. Unless otherwise noted, boxes are in used condition that at least meets our minimum quality standards. For complete details visit our condition and sizing of used boxes page. Keep in mind that we will need to contact the seller to confirm box availability and appointment time. While we contact sellers by all available methods (email, phone, sms, and fax), the less advance notice you provide the less likely it is that the seller will reply to our request within your appointment choices. Allowing a few days for your pickup will reduce stress and uncertainty and increase the chance of a successful transaction. If you require boxes very quickly please order from AC (Auto-Confirm) sellers. They do not require a confirmation step and you will receive their location immediately after ordering. If there are no Auto-Confirm sellers in your area you will need to place a regular order and commit to two appointment times. Consider performance metrics and A+ status to select a seller most likely to reply quickly. Set the 1st Appointment Choice to as soon as possible and choose the longest acceptable time range using the +hrs dropdown. To increase the chance of seller's response, set the 2nd Choice to allow as much additional time as you can. If you'd rather minimize your commitment to the order, set the 2nd Choice to the earliest time allowed during checkout. Please make sure that you are able to commit to both choices or are willing to pay the cancellation fee. Although many orders are confirmed within hours, there are no guarantees. Leave yourself sufficient time to get boxes elsewhere in case the seller doesn't confirm the order in time or you run into unlikely issues after confirmation. If your situation requires full certainty, please use a traditional box seller. If none of these options are available for a seller, then your order from them will need to be picked up. No, this would be far too much work for sellers. However, you are protected from surprises. Sellers are not paid until after your successful pickup. Simply report issues like not as described, missed appointment, etc. to us. Even if boxes are as described, you can elect to not complete the pickup at the cost of a modest cancellation fee. The small risk of paying this fee should be well worth the savings you typically get. Most boxes exceed our minimum quality standards. Seller's exact address is provided after you place a pickup order and the seller confirms it. Map of seller locations, which can be zoomed in to street level to get the exact neighborhood. Distance to each seller from your specified search location. Driving distance, time, and directions to each seller from your specified search location. We have a small minimum order of $2. Individual sellers can set their preferred minimum order size; the default is $10. You may also request order cancellation at an earlier time, but cancellation fees will apply. You'll have the option of transferring a cancelled order to another seller if one is available in your area. To maintain listing quality we remove listings of sellers who do not reply within a reasonable period of time. We will email you an order notification as soon as we receive your order. If you don't receive it within a few minutes, make sure that your email system isn't blocking our email and that you didn't make a typo. This order notification email will include a login link to view your order status online at any time. This link is also included in most follow-up communication. Finally, we may do an appointment reminder email, text message, and/or automated phone call. We try to minimize the annoyance of receiving multiple notifications from us and your own calendar, so these reminders are only sent in situations when forgetting is more likely. They should not be relied on as your primary way of remembering your appointment. Please keep in mind that email we send can be blocked or moved to spam. We strongly recommend that you elect to receive text messages and/or check order status online near your appointment choices. You are responsible for showing up to your confirmed appointment. We take a number of steps to maintain high quality of listings on BoxCycle including promptly removing inaccurate listings, managing seller inventory, and tracking seller performance. Although out of stock situations are less likely with BoxCycle than with many other sources of used boxes, they are still possible. We manage such situations quickly to minimize your inconvenience. If the seller no longer has boxes they will notify us during order confirmation, often within a few hours of your order. You will then be able to cancel the order or transfer it to another seller. We will remove seller's listing to prevent other buyers from having the same problem. You can help minimize out of stock situations by ordering your boxes with more advance notice. Many sellers receive boxes continuously and can fill orders with a bit of time even if they don't have sufficient stock at the moment of your order. Allowing more time will also help us locate alternate sellers for you. You have issues with your confirmed appointment that were caused by the seller and could not be prevented by you. You may cancel your order for another reason, but cancellation fees will apply. If you decide to cancel you should do so as soon as you can since fees are generally higher the further along in the process you are. For example, fees are less when cancelling before the order is confirmed than after, and are less when cancelling with a lot of time before the appointment than with little. Fees may also apply to some order adjustments; you should request any adjustments as quickly as possible to minimize fees. Most cancellations and adjustments can be requested online from your order status page. You'll find available options and applicable fees in the Take Action section near the bottom of the order status page. Cancellations, adjustments, and missed appointments significantly inconvenience sellers and disrupt the box reuse process. As a buyer, you must commit to your order and honor your appointment, or pay fees to at least partially compensate the seller for the extra work and inconvenience caused. We realize that things occasionally come up so fees are intentionally kept small, especially when you act quickly. However, fees are not negotiable. Keep in mind that BoxCycle also issues credits to you when sellers miss appointments or do not provide promised boxes. Boxes must match the specified details and meet our size and quality guidelines. If you find seller's boxes to be not as described, report the issue to us. We'll help you locate an alternate seller or cancel the order. We'll also issue a $5 store credit for your inconvenience. Finally, we'll contact the seller to help them understand the requirements and adjust their listing so the problem does not occur in the future. Be sure to resolve quality issues before you take the boxes. You are free to come to a mutually acceptable resolution with the seller and/or get us involved as needed. We can adjust orders and issue discounts for mis-described boxes with seller's agreement. First, try to contact the seller using our Anonymous Connect feature. Often they are actually at the location or close to it. If you can't reach the seller or are unable to get an acceptable resolution, please report the issue to us once lateness exceeds 15 minutes. We will track the complaint against the seller, issue you a $5 store credit for the inconvenience, and help you locate an alternate seller and transfer the order. You'll receive the seller's address when your pickup appointment is confirmed and will be able to print driving directions through your online order status page. You can also print directions yourself through your preferred mapping service. If you get lost along the way you can contact the seller using our Anonymous Connect feature and they will often be able to walk you through the directions. Please note that although you may be able to get help over the phone after you leave, it is ultimately your responsibility to make it to the appointment on time. Please make sure that you have valid directions prior to leaving. You may be responsible for significant lateness or a missed appointment if you aren't able to find a valid address. You should report any issues with your order as quickly as possible through your online order status page or by contacting us (leave a voicemail if necessary). Once the order is completed you will be charged, the seller will be paid, and there will be limited options for resolving problems that weren't reported. The buyer reports successful completion. Order is completed immediately. The buyer and the seller do nothing. Order is completed automatically in 2-3 days. We'll send the buyer an email reminder prior to automatic completion. The seller reports successful completion. We'll send the buyer an email notification; they'll have at least 6 hours to report issues and override seller initiated completion. If the buyer does nothing the order will be completed automatically. When you place an order, your payment is authorized, but not charged. This authorization (sometimes known as a pending charge) does not transfer any money to us. However, it does reserve the amount due which will reduce your available balance. In some online bank systems, especially when you use a debit card, an authorization can appear exactly like a charge. This authorization process is the normal, recommended way of processing online transactions and is not specific to BoxCycle. If your order is cancelled, a charge will not be put through. We'll automatically reverse the authorization when possible. Otherwise, the authorization will automatically expire and disappear after a time period that depends on your card issuing bank, generally within about 7 days of order. There is nothing we can do to remove it sooner. If you still see an incorrect charge 10 days after order date please contact us so we can make sure there wasn't a mistake. There is typically no separate refund transaction.